Today, when you order "Leatherbound", you'll instantly be emailed a Penguin Magic gift certificate. You can spend it on anything you like at Penguin, just like cash. Just complete your order as normal, and within seconds you'll get an email with your gift certificate. 'Leatherbound' is a new and offbeat concept that breaks new ground in 'card to wallet' methodology. Learn the amazing secret behind the 'psychologically invisible' gaff cards that sit innocently inside your wallet at all times, waiting to be called into action. You'll be able to end almost any of your card routines with an impossibly clean card to wallet kicker without palming and without the need for expensive magicians wallets. Every magician Dave has ever shown the 'Leatherbound' concept to has been first fooled then blown away by the 'chameleon-esque' nature of these diabolical gaff cards! Relying on a devilish combination of subtlety and stealth, these 'lo-tech' gimmicks are guaranteed to make you smile! A few minutes of preparation then grab ANY wallet - 'Leatherbound' is always ready to go! The 'Leatherbound' DVD and download comprise a full 50 minutes of in depth tuition. The gaffs are discussed in great detail including several different ways of introducing them to the pack plus one awesome variation that utilises a THIRD gaff! Each of the five killer routines are performed and then taught in full detail including all the moves, timing and subtleties. 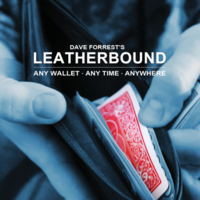 'Leatherbound' is a cool concept but you'll get SO MUCH MORE from this product than just a card to wallet! BASIC CARD TO WALLET - The CORE Leatherbound concept - straight up! PARADOX CARD TO WALLET - An interesting spin on the concept that cranks it up a notch! TRASH TRANSPO - You show them a card in your wallet. It cleanly changes places with their signed card! RECORDED DELIVERY - A mystery card, chosen and signed on the back by the spectator, somehow appears in your wallet! THINK TWICE - A spectator successfully divines the exact card you always carry in your wallet! EASY TO DO. NO PALMING. USE ANY WALLET. ALWAYS READY TO GO. PERFECT 'JAZZ MAGIC' TOOL. FIVE ROUTINES INCLUDED. I have spend a large amount of money in special wallets, some of them are very useful, but this system is really brilliant. You can do your favorite routine of card to the wallet, paradox card, etc. using your regular wallet with this intelligent principle. Highly recommended. But be advised you will need a pair of Gigantic Co-Jones to pull it off !& there isn't a magic supply house that Carry them !!! So you'll have to grow your own ! The instructional is well put together,he dose a superb job at explaining every nuance of the effect's break down ,everything is well thought & planned out its up to the performer's skill level !